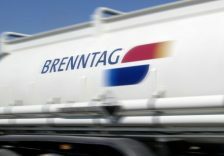 Leading chemical distribution company Brenntag has reported an increase in gross profit and operating earnings in 2016, with strong performance in the EMEA and Asia Pacific regions. The results were achieved in a highly varied economic environment across the globe. Earnings in North and Latin America were negatively impacted by several economic and political factors, but the existing business in the EMEA and Asia Pacific fared well, and the acquisitions made a positive contribution. Brenntag generated sales of EUR10,498.4 million in financial year 2016, an increase of 1.5%. The Group also delivered a strong growth in gross profit, an especially important metric for Brenntag, of 4.6% year on year to EUR2,369.3 million. Operating EBITDA was up on 2015 to EUR810.0 million, a rise of 0.3% and in the middle of the range forecast for 2016. An increased divident of EUR1.05 (up 5% on the previous year) wil now be proposed at the General Shareholders’ Meeting on June 8, 2017.